Jean Kent starred in the Edwardian romance Carnival – above. Film and television actress Jean Kent, one of Britain’s biggest stars in the 1940s and 1950s, has died. She was injured in a fall at her home in Westhorpe, Suffolk, and died at the West Suffolk Hospital in Bury St Edmunds at 03:40 GMT. Her death was announced by a close family friend, author and former film critic Michael Thornton. Her last public appearance was in 2011 when she was honoured by the British Film Institute on her 90th birthday. Mr Thornton said: “I knew Jean for more than 50 years. She was a feisty, funny, outspoken character who never took herself too seriously. 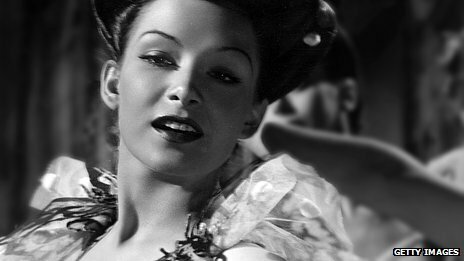 Kent’s career included regular appearances in Gainsborough melodramas, which were popular with large numbers of newly-independent women following the outbreak of the Second World War. She made 45 films and during her career starred alongside Marilyn Monroe, Michael Redgrave and Laurence Olivier. 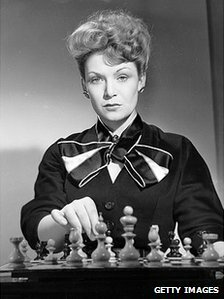 ‘Bodice-ripping melodramas’Born in Brixton, south London on 29 June, 1921, she was the only child of variety performers Norman Field and Nina Norre. As a 13-year-old she performed at the Windmill Theatre in London’s West End. Above – A wonderful scene from The Browning Version 1951 – one of my own favourite films. 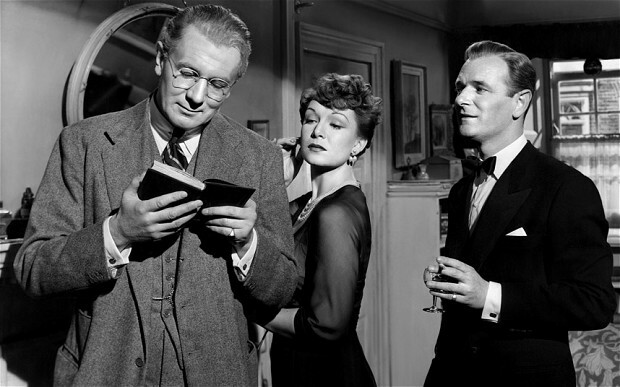 Here Jean Kent as the cruel wife of Michael Redgrave looks disdainfully at the book given to her husband by one of his pupils – something that means a great deal to him. She had met her husband Josef Ramart on the set of Caravan and they married four months later in 1946, with Stuart Granger as best man. They bought a farm near Sudbury, Suffolk in the 1950s and stayed there for 20 years until they moved to Westhorpe. Her husband died in 1989. Kent also had a television career, which started in the mid-1930s in a musical called The Ship In The Bay which was broadcast live. Her post-war television appearances included roles in Up Pompeii!, Crossroads and Lovejoy. Speaking on her 90th birthday she told the BBC she was still available for work. “Oh yes, I’d work like a shot, as long as I didn’t have to walk,” she said. 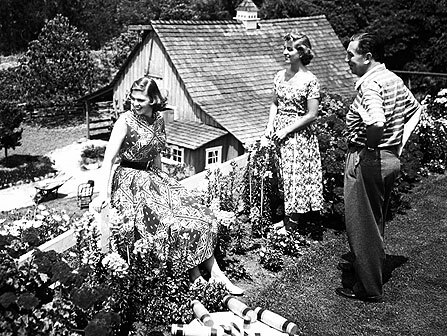 Lovely photograph of Walt Disney at home with his two girls – overlooking the Old Barn he had constructed in the grounds which he had taken from his childhood home. 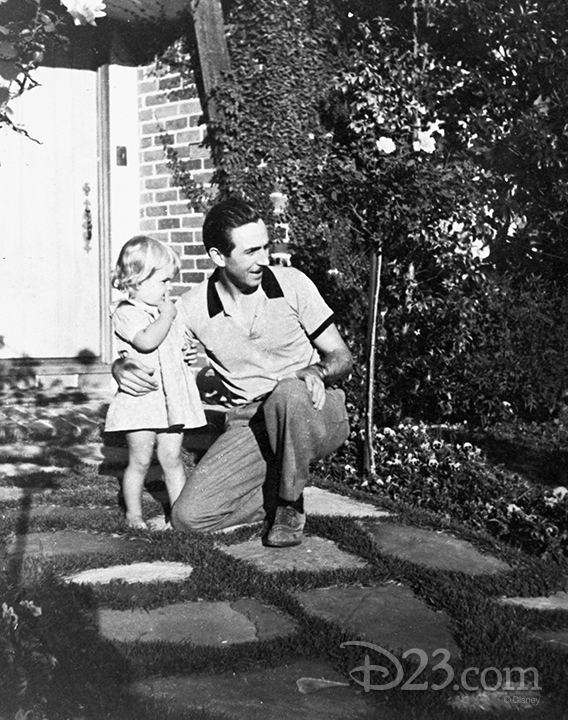 Walt Disney with his daughter Diane – above. Diane Disney Miller, a Napa Valley winemaker and the reason why the Walt Disney Family Museum is located in San Francisco, died Tuesday. Mrs. Miller succumbed to injuries suffered in a fall a few months ago in Napa, where she had a home. She was 79. As the only surviving child of Walt and Lillian Disney, Mrs. Miller was the president of the Walt Disney Family Foundation and co-founder, with her son, Walter Elias Disney Miller, of the Walt Disney Family Museum. Last year more than 100,000 people visited the museum, which is on track to hit 150,000 in 2013. She read her father’s original dedication fifty years later to the day at the birthday celebrations of Disneyland on July 17, 2005 and organised the development of The Walt Disney Family Museum in San Francisco. The museum opened in October, 2009. Diane Disney Miller wrote the foreword to the book Walt Before Mickey by Timothy Susanin. The book covers the early years of Walt Disney’s career. “She was totally devoted to the memory of her father. She obviously just worshiped him, and everything she did at the museum was to honour him, and to be sure that people knew the accurate story,” said Nancy Bechtle, who served with Mrs. Miller on the San Francisco Symphony board and recently helped her find a new director for the museum. A resident of the Bay Area since the mid-1980s, Mrs. Miller was a benefactor to the Symphony and Napa’s “Music in the Vineyards”. Diane Marie Disney was born Dec. 18, 1933, an event that caused the Los Angeles Times to proclaim “Mickey Mouse has a daughter.” She was educated at the University of Southern California, where she met Ron Miller, a member of the football team, on a blind date after a Cal-USC game. They were married in Santa Barbara on May 9, 1954. Miller had a career in pro football before being recruited by his father-in-law. After their seven children had grown up, he left the firm, and they left Los Angeles for Napa, where they owned Silverado Vineyards. She is survived by her husband; children Christopher Miller, Joanna Miller, Tamara Diane Miller, Jennifer Miller-Goff, Walter Elias Disney Miller, Ronald Miller and Patrick Miller and grandchildren. Services will be private. A public celebration at the museum is pending. In lieu of flowers and gifts, donations may be made to the memorial fund that the Walt Disney Family Museum has created in honour of Diane Disney Miller. Now this is one I remember seeing years ago – probably at the local Pavilion Cinema – now no longer there alas ! The background to this film is that at the time there was a very popular song with the same title as the film, that did so well on both sides of the Altlantic. 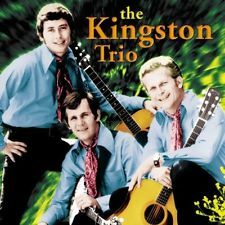 The American version which was a hit in the UK was performed by The Kingston Trio who were in the charts in England as well, although it was covered here and a hit for Lonnie Donegan. Because of the hit song one assumes, a B movie was rushed out very quickly – and must have done well. Michael Landon starred as Tom Dooley before his success on TV first with Bonanza. 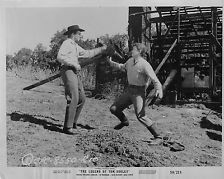 The story begins when Tom Dooley (Michael Landon) and (Richard Rust) kill someone in the line of following their orders as soldiers not knowing that the Civil War is over. They thought they were just doing their jobs, but are now now branded murderers and try desperately to get away. The main characters played by Landon and Rust were likeable types who the audience can sympathise with for the predicament they are in. Part of the story is that Landon and Rust might get away, but Landon insists on going back to get his girl so she can come with them. This leads to the film’s inevitable final outcome. This film moves along at a good pace and stays interesting throughout the 79 minutes. It has engaging characters caught in an impossible situation. We can all think of a great many songs associated with films of an era – but this was a feature film rushed out to capitalise on a very popular song with a storyline. Very much of it’s time though. Walt Disney had huge faith in Perce Pearce both in his film making skills and his ability to get things done. He entrusted Perce to come to England and supervise his first all live action films at Denham Film Studios – Treasure Island and The Story of Robin Hood being the vital and first ones. 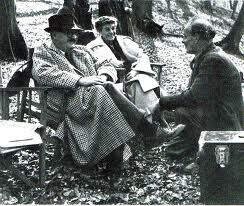 Above: Perce Pearce seated in overcoat with Set Designer Carmen Dillon and Second Unit Director Alex Bryce at Burnham Beeches for filming of Ther Story of Robin Hood (1952) for Walt Disney. The British government, in an attempt to revive its own film industry after the war, had imposed a 75% import tax on American films shown in Britain and ordered that 45 % of the films shown in British cinemas be made in England. Walt couldn’t set up an animation studio in England or France, but he had another option. He could make a live-action film in England and finance it with the blocked funds -and this he did with the first two made at Denham. 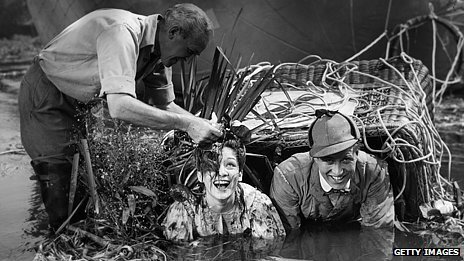 The project Walt selected for his live- action feature was Robert Louis Stevenson’s Treasure Island and he despatched Perce Pearce and Fred Leahy to England to supervise the production, but he remained unusually involved in the post production at least compared to the offhanded way he had been treating recent films. He had asked Pearce and Leahy to air-mail him specific takes for editing, and after a test screening in early January, he ordered them to cut ten to twelve minutes and provide a more forceful musical score; he also advised them that a more detailed criticism would follow. Two day later he ordered the editor to fly from England to Los Angeles, apparently so that Walt could oversee the editing himself. Perce Pearce’s career at this point took a major turn: he began working in live action, serving as Walt’s associate producer on Song of the South and So Dear to My Heart before moving to England to shepherd Disney’s first entirely live-action features (Treasure Island, The Story of Robin Hood and His Merrie Men, The Sword and the Rose, Rob Roy the Highland Rogue) onto the screen. In other words, Walt repeatedly chose Pearce to act as his surrogate. Above: Walt Disney with his family on the set of Treasure Island during their visit here in 1949. Bobby Driscoll one of the stars of the film with them too. This shot is actually on one of the sets at Denham Film Studios. There may have been a bit of typecasting when Walt sent Pearce to England—he was the son of English immigrants—but what was undoubtedly more important was Pearce’s adaptability, and his willingness to respond to the demands Walt made on him. Throughout the 1940s and ’50s, people who had joined the Disney staff to work on animated cartoons followed similar paths, moving into live action or, later, into television or designing attractions for Disneyland. Ben Sharpsteen was an animator, then a director of short cartoons and feature sequences, and ultimately the “supervising director”—that is, Walt’s man on the ground—of Fantasia, Dumbo, and other features. But then, as Walt’s interest turned toward the True-Life Adventures and the People and Places series, he took Sharpsteen away from animation and put him in charge of those live-action films. Likewise, the director James Algar moved from animation into directing the True-Lifes. From all appearances, Perce Pearce adapted well to his life in England—in stories about him that I turned up during work on The Animated Man: A Life of Walt Disney, he sounds like a true English eccentric. There’s no telling if such stress contributed to Pearce’s early death in 1956, but it couldn’t have helped. 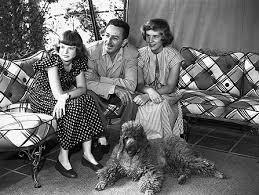 In July 1951, just as his cartoon version of Alice in Wonderland was released in America, Walt Disney visited Europe with his wife Lillian and his daughters to supervise his second live-action movie. The Story of Robin Hood and his Merrie Men (1952) again financed by the blocked monies of RKO and Disney. Before leaving, Walt had screened films at the studio, looking at prospective actors and directors and making what he himself called ‘merely suggestions’, while he left the final decisions to Perce Pearce, who was producing. For his part, Pearce had laid out every shot in the movie in thumbnail sketches, or storyboards, just as the studio had done with the animators, and sent them on along with photostats and the final script to Walt for his approval, which Walt freely gave, though not without a veiled threat that Pearce had better make the film as quickly as possible. “This is important not only to the organisation but to you as the producer,” he wrote. 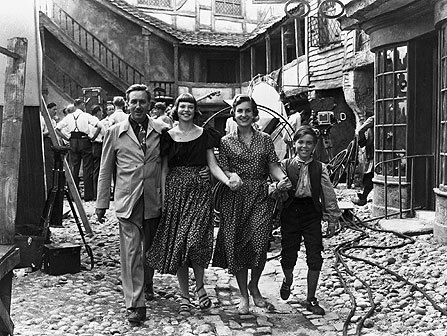 Meanwhile as Robin Hood was being filmed, Walt, Lillian and his daughters wandered through Europe, visiting the Tivoli Gardens in Denmark, and did not return to the studio until August. While making those live action movies in England (which also included Sword and the Rose (1953) and Rob Roy the Highland Rogue (1954)). This one was on TV very recently and was shown in wide screen Cinemascope format which I like to see, and in glorious Technicolor. Jeffrey Hunter (Little Dog) portrays a fiery young Cheyenne Indian brave in a story of a peace mission by the US Cavalry to the Cheyenne Indians in Wyoming during the 1870′s. The peace treaty negotiation with the Cheyenne (and other local Indian tribes) has the goal of relocating the tribes, in order to open up the territory to gold prospectors. 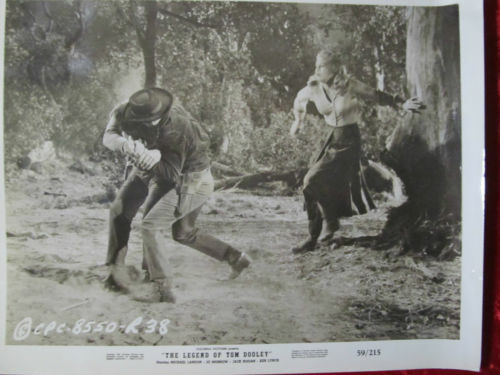 The peace treaty is threatened when a surveyor (Robert Wagner), there to map out the town that is planned for the gold miners, falls in love with the chief’s daughter (Debra Paget). Also starring John Lund, Virginia Leith, and Eduard Franz. Well this film programme would have been a ‘must’ for cinemagoers at the time I reckon. 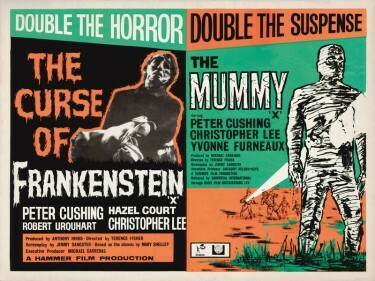 A real Double Bill of Classic Hammer Horror Films. This time Dracula and The Mummy. 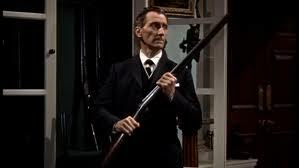 Above in The Mummy – Peter Cushing prepares for action !!! As as long term film fan, I always seem to look out for locations that I feel would be great for use in a movie. 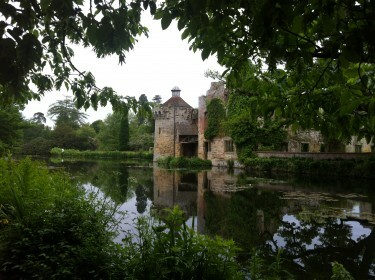 This is one of them – Scotney Castle at Lamberhurst, Near Royal Tunbridge Wells, Kent TN3 8JN in England. We visited in June 2013. I love the scene above. Jim Hawkins escapes the clutches of Long John Silver and runs through the water onto the island and then hides. Filmed of course at the legendary Denham Film Studios. One of the first films I ever saw at the cinema – and one of the very best too. Colour unsurpassed !!! It s really exciting just to see this – and of course it makes you want to go and see the film. It was and is a great movie.